Cranberry turkey goat cheese crepes...You fancy huh? And with asparagus and a béchamel sauce? This sounds too good to be true. Will it take five hours to cook and take thirty pots and pans? Nope. 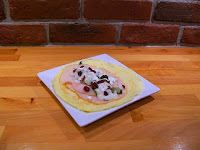 This recipe is actually surprisingly simple, and looks and tastes amazing (not to mention people go crazy when crepes are involved. For some reason everyone thinks they're sophisticated). 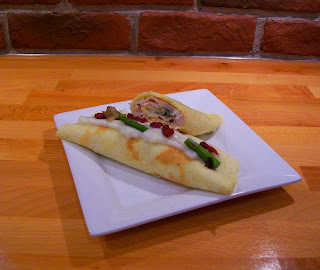 1 package of store bought crepes or make your own crepes (choose from thousands of recipes online, pretty simple). Thinly sliced turkey from your local deli or supermarket. If you don't like turkey use chicken, and if you don't like chicken and are a vegetarian, use that Tofurky stuff that probably tastes horrible. 3-4 tablespoons of parmesan (the powdered one). Dash of oregano or rosemary, up to you. Reheat in oven or microwave if need be. For LA SAUCE! (We are zee French). Note* If the sauce is too liquidy, add flour. If the sauce is too clumpy, add milk. If the sauce tastes disgusting, add butter. If the sauce just tastes like butter, add herbs. This really is fail safe, you just keep throwing things into the pot until it tastes and looks good. Hope you enjoy this recipe, and if you did, make sure to share it with friends, leave a comment, subscribe, or do all of that stuff! Thanks, and cred to the Sister for the recipe. Hi Tom, just wanted to let you know I tried this recipe and it came out pretty neat. I salivated first reading your description of it but for some reason, I am always intimidated by the bechamel sauce. The way you put it, basically throw all you've got at it, made me go ahead. Glad I did and thank again. What are you cooking next? As for what I'm cooking next I am not too sure but am open to ideas. I might try however the kit kat lasagna recipe that has been going around.